JCB has chosen a very dramatic moment to illustrate for his dust jacket of Tarzan the Magnificent. In the closing battle scene in chapter xxv the war lions of Cathne clash with the war elephants of Athne. Tarzan is standing on the very edge of the howdah in the process of dispatching three Athnean warriors. He has just disemboweled one of them with a quick upward slash of his knife, who is already falling backward, when a mighty tusker grasps a lion, and lifts it high into the air, which sways the howdah wildly. We see Tarzan glancing briefly at the disturbance while cat-like he keeps his balance. He only pauses a moment for this snapshot painting, then swings toward the man closest to him, and with another slash of his knife, he cuts the man’s throat while at the same time dodging the spear cast by the third. The painting is a tour-de-force of action. The elephant with the lion wrapped in its trunk is the first thing we notice in the foreground, but Tarzan is the center of attraction outlined and surrounded by a blazing sun that rolls in great clouds of fire and destruction. In a nice touch, JCB has arranged two lions to be seen on the spine of the book when it sits on the shelf. A leaping lion and another below, which already has half of a man’s head in its mouth. An interesting part of this painting is the close-up perspective JCB chose to illustrate this scene. 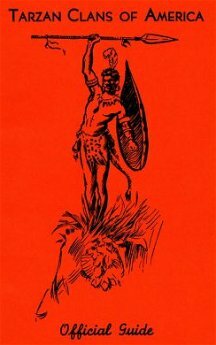 You might like to compare it with Frazetta's "Stone Age"-- illustration #2 in "The Fantastic Art of Frank Frazetta" where he pictures a mastodon throwing saber-tooth cats all over the page. JCB comes off rather static in comparison with Frazetta, but his concept is daring nevertheless. He really puts the elephant and lion in your face even though it stands like a sculpture fixed in time. A rather cartoony Tarzan sits astride a nicely drawn lion which is leaping into the air trying to dislodge its deadly rider. 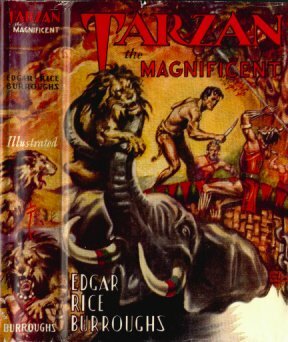 Tarzan holds a very long dagger, almost a short sword in size, in his left hand. 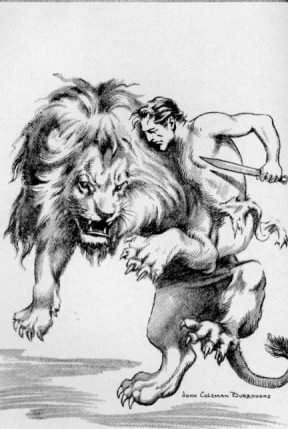 The pose of this battle between man and lion is reminiscent of J. Allen St. John’s fine dust jacket illustration for Tarzan and the Jewels of Opar. Although the St. John painting is a more powerful conception with man and beast locked into one, almost a single beast -- an effect he was so often able to achieve, the JCB lion is quite well executed. We will add the JCB interior illustrations as they become available.